types of enquires, such as for block bookings or one-off appointments. 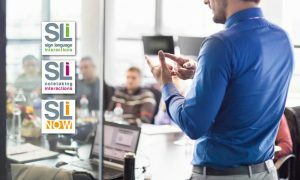 BSL/English Interpreters we assign to your requests are registered with either SASLI or NRCPD, PVG Registered and are covered by professional indemnity insurance. They are also required to follow our strict code of conduct and abide by the SASLI/NRCPD professional code of conduct, which provides guidance on the handling of confidential and sensitive information. We can also provide Deafblind Interpreters, Electronic notetakers and Lipspeakers. SLI is also an agency registered member of Scottish Association of Sign Language Interpreters. 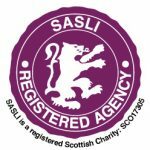 SASLI has a Chartermark for registered agencies, the Chartermark is an indication that the agencies have met SASLI’s quality assurance standards. We are passionate about providing communication services and working in partnership with other organisations who share the same objectives. Our staff are fully committed to providing the best quality of service possible. 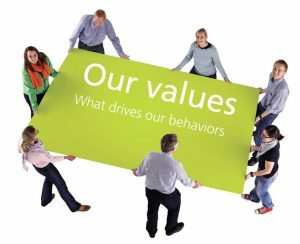 Our LSPs adhere to the Code of Practice as directed by other professional bodies i.e. SASLI Code of Practice. From the first step of booking a service, through to the actual delivery – it is important to us that the service you receive is provided in a reliable and organised way ensuring at all times that this is done in a friendly and helpful manner. To facilitate communication between Deaf and hearing people, so that language is no longer a barrier to understanding and opportunities. * The term Deaf includes: Deaf, Deafened and Hard of Hearing * Language Service Professionals is the generic term which includes: BSL/Eng Interpreters, Lipspeaker, Electronic Note takers, Deafblind communication.